We are a popular hostel with a friendly, homely atmosphere. We’re located just minutes’ walk to Parnell Village, the city centre and to cinemas, bars, restaurants and shops, but away from the noise. We have a new system installed in all the room called DVS; it gives fresh air in all the rooms, 24 hours a day. Enjoy beautiful green parks, museum village, pub and harbour views. Take advantage of the airport direct shuttle service. Our lovely clean rooms include dorms, doubles, twins and singles. We can accommodate up to 20 people at a time. A common kitchen is available for the guests to use along with free tea/coffee and free herbs and spices. You can chill out in our cosy TV/DVD lounge. We offer free internet and free Wi-Fi as well as travel information, bookings, bag storage and mail holding. We also do car rentals at very competitive prices. If you arrive in the early morning, you are most welcome to come to the lodge after 8am to relax in our TV lounge, have a cup of coffee and check your emails ‘til your room is ready. The kitchen needs to be updated only two cooking pots are usable and only two of the four burners of the stove are working.Parking is free and adequate comparing to other hostels where parking is unavailable.Wifi is good and fast even in the room. Lovely place, very helpful staff and great location! Thanks! 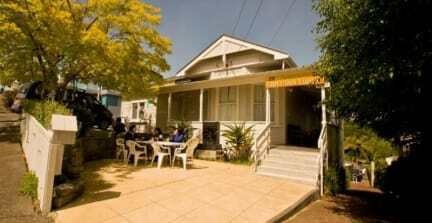 It’s a good first hostel in New Zealand as its a quite suburb. Over all not bad and value for money! My bed was a mattress on the floor beside a wall, every time I moved I rolled into the wall. I don’t see how this can be the same price as an actual bed when I am sleeping on the floor. How can you say this was an 8bed room when two beds where mattresses on the floor. Also, I don’t mind the no shoe policy if the shoes stay outside the bedrooms. My room smelled so bad of feet, even with the window open. Also people drying their clothes in the rooms, starting to smell like damp in the room. We had a private room, the room was a good size, the bedsheets however were scratchy and made us feel like itching all the time. The hostel wasn’t very clean, mould was all over their showers, bits and pieces of the bathroom falling apart. We stayed because they said they had parking and while they do have parking it’s three spots that are always in use. You can park on the road for free but will have to move your car every two hours! Making travelling impossible. We won’t be staying here again! Awful hostel, never stayed at a hostel this bad. They say 'Free parking' while there are only 3 parking spots for the whole hostel, which are obviously always occupied. Parking in the street is possible, however you have to MOVE your car EVERY 2 HOURS!!! Exploring Auckland is impossible if you have to move this often. The staff could not provide proper information about alternatives for parking and how often the parking is checked. Do not go here because of the parking!! !